Developing a whole school or year-level approach to the delivery and dissemination of classes and activities via interactive whiteboards, one-to-one iPad or laptop programs or even IWB alternatives can have drastic impacts on student engagement and achievement. Regardless of whether your school has interactive whiteboards, is looking into purchasing them, is researching alternative cost-effective methods or adopting a one-to-one iPad or laptop program, it is vital that year levels, coordinators and heads of school meet all together to extensively plan and create whole year-level technology and methodology rich Literacy and Mathematics units using their collective expertise. See the following exemplar model below for further details. Whilst many a teacher has designed PowerPoint slides to deliver lessons via interactive whiteboards, I was blown away by the whole-school and year-level professional approach adopted at Elmwood Junior School in regards to their design and delivery of engaging and effective learning in Reading and Writing. Regardless of the classroom or age, I found that I was able to enter into any classroom to find students engaged in clearly planned and well-thought out PowerPoint presentations that could be described by no other word than "outstanding". In Year Six classrooms, students were exploring the narrative genre. In Writing, students were engaged in learning about the fantasy narrative genre through an expertly designed PowerPoint presentation (approximately 100 slides). The presentation was clearly designed around the National Literacy Strategies document, 'Year 6 Planning Exemplification 2002–2003: Narrative Writing Unit', containing the exemplar narrative 'Bloddon's Adventure'. Each section of the narrative genre (orientation, build-up, dilemma, resolution and conclusion) was taught with a main objective (i.e. To write an engaging orientation) and a sub-objective (i.e. To learn how to use semi-colons). After learning about the orientation of a narrative (main objective), and then commas (sub-objective), the students or teachers then read aloud the orientation of 'Bloddon's Adventure'. After reading the orientation, the staff at Elmwood had prepared the following slides to contain the same section of the story with various phrases and words highlighted. The question was then posed to students to get them to analyse and discuss as to why these phrases or words had been highlighted. Thus the students were readily able to identify and use the exemplar literary devices contained within each part of Bloddon's Adventure. In Reading, students were engaged in learning how to answer questions using the P.E.E (Point, Evidence, Evaluation/Explanation) strategy. Using Michael Morpurgo's short story, 'The Giant's Necklace' in the book 'From Hereabout Hill', which was displayed on the IWBs via scanned pages inserted into a PowerPoint slide, teachers had inserted pop-up questions to appear after the students had read various paragraphs. Even the most modest of students were able to easily answer complicated question stems by repeating the question (point), locating and quoting evidence from the text (evidence) and then give an evaluation or explanation as to why their answer would make sense. Q1 - Why did the students stop swimming in the water? A1 - The students stopped swimming in the water because there were sharks, and if they continued to swim they ran the risk of being eaten alive! In Writing, the Year Three team were employing the use of a semi-scaffolded narrative writing unit, again in the form of a PowerPoint presentation on the classroom IWB. Entitled 'Lost', upon clicking on the title slide, the black background disappeared and a high-definition image of a forest appeared on slide one. The writing stem 'I was walking through the forest when', appeared and the students quickly copied the stem and wrote their sentence finisher with great enthusiasm. After sharing some of their sentences, tapping on the IWB transitioned to slide two, the same high-definition image but this time with animated rain falling! The sentence stem, 'All of a sudden it started to rain and', appeared and the eyes of the students lit up. They quickly copied the stem and again finished the sentence. After again sharing their responses, students were then given an allocated time to complete their story without the need for further sentence support. This scaffolded approach, combined with really beautiful and detailed images, really captured the imagination of the students, leading to the creation of wonderful short stories by the students. Providing such a well-planned and curriculum rich method of delivery ensured for excellence in teaching and learning. Having viewed the benefits for both staff and students first-hand, I returned to Australia and spent three months full-time, researching, planning, creating and sourcing a wide-variety of units for all subject areas, particularly in the areas of English and Mathematics. This effort resulted in the development of lesson resources for every content descriptor and elaboration contained within the Australian Curriculum and AusVELS Mathematics strands and sub-strands, for Foundation to the end of Year 7 and the majority of the statements within the English curriculum, ready to run on an IWB, laptop, android tablet/phone, iPad, iPod or iPhone! These lessons and activities could be used in whole class, small group and independent work scenarios. When used independent of the teacher (by extension students or students who were absent and were catching up with the class) the lessons and activities had many parallels to the independent learner Goodger Maths program implemented primary schools in the 1980s and the Kent Maths program implemented in secondary schools in the 1990s. 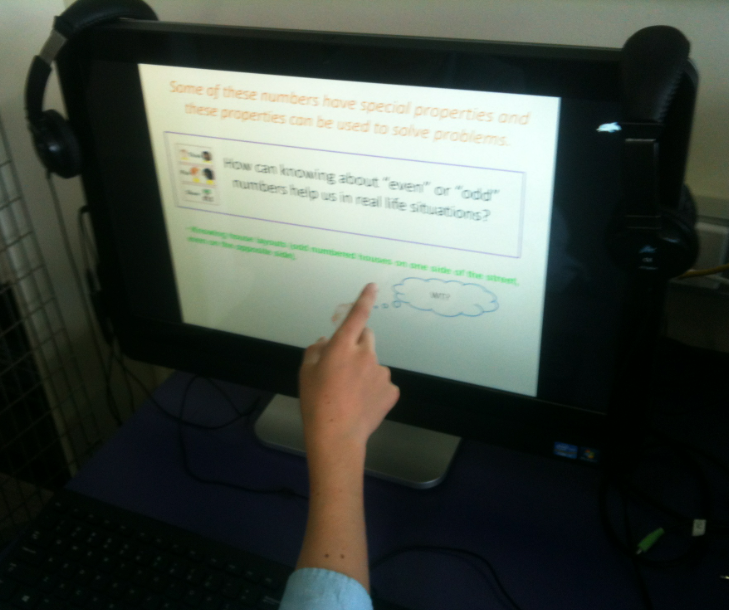 A Year Six student independently learning about the properties of numbers (odd/even, square, cubed, decimal, positive, negative, triangular, composite/prime and Fibonacci) on a touch-screen computer. Once schools or year levels have developed their unit resources for English and Mathematics and combine them with approaches to effectively integrate ICT into the other subject areas, it becomes a simple task to create additional lesson resources for the other curriculum areas. Cross-Curriculum: Blogging & Wikis, Interactive ePortfolios, Teaching & Learning Through Video Games, Learning About & Respecting Copyright, QR Codes in Literacy & Art, iOS (Apple) Devices and Android Devices.